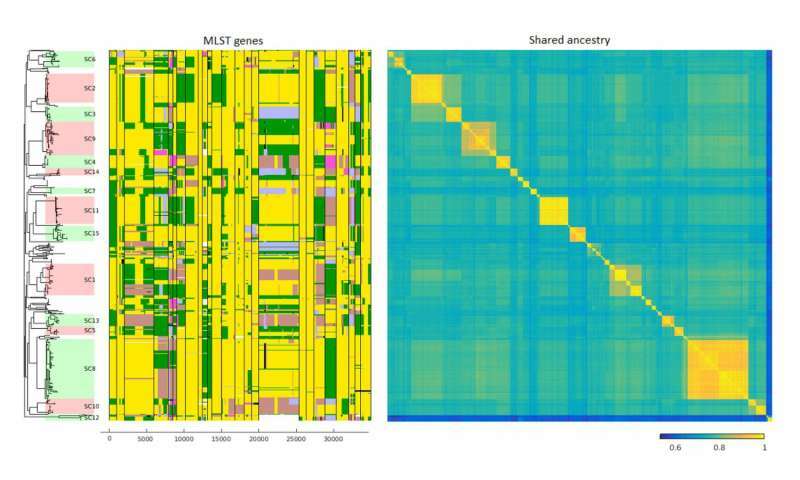 In a recent study combining machine learning and bioinformatics, a new computational method was developed for modelling gene transfers between different lineages of a bacterial population or even between entirely different bacterial species. The method was used to analyse a collection of 616 whole-genomes of a recombinogenic pathogen Streptococcus pneumoniae. In the study, several individual genes in which gene transfers were considered particularly common were identified. These genes also included genes causing resistance to antibiotics. 'In the case of antibiotic-resistance genes, the number of gene transfers may be related to how useful these genes are to bacteria and to the resulting selection pressure', says Academy Research Fellow Pekka Marttinen from the Aalto University Department of Computer Science. 'The study will not provide a direct solution to antibiotic resistance because this would require a profound understanding of how the resistance occurs and spreads. Nevertheless, knowing the extent to which gene transfer occurs between different species and lineages can help in improving this understanding', he explains. The study was able to show that gene transfer occurs both within species and between several different species. The large number of transfers identified during the study was a surprise to the researchers. 'Previous studies have shown that gene transfers are common in individual genes, but our team was the first to use a computational method to show the extent of gene transfer across the entire genome', Marttinen says. Molecular Biology and Evolution published the results in February.